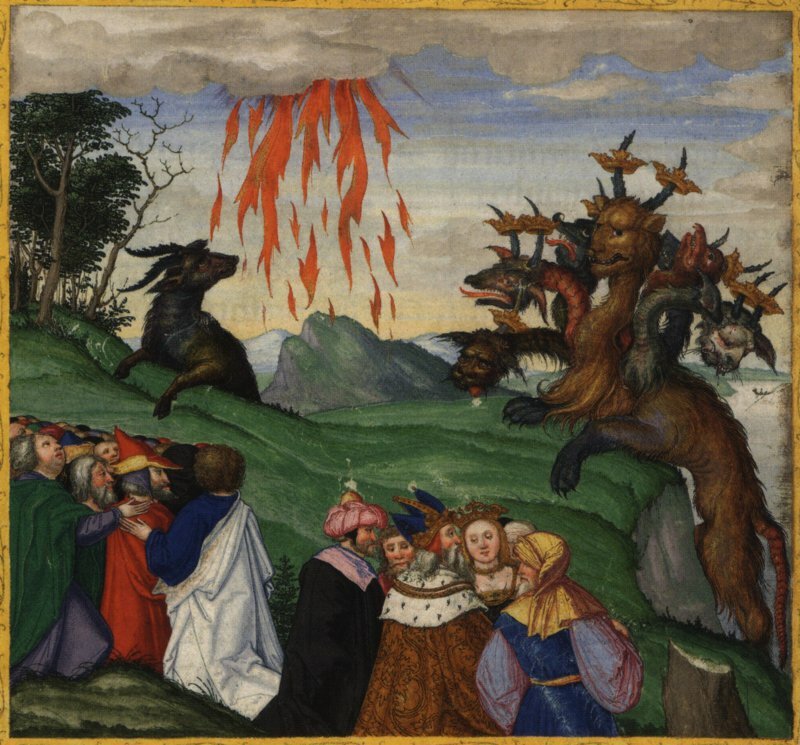 Who is The Beast of Revelation ? But you will notice in Revelation, that the Beast or the Antichrist of Revelation is an individual - not an organisation or an ideology. See David Pawson's observations on page 1299 of "Unlocking the Bible". Malcolm Hedding spoke on the seeking to know identity of "the Man of lawlessness" at the 2007 ICEJ conference in England. The following has been prepared from that address and is used with his kind permission. A source of the CD of this address has not been arranged as yet. The Antichrist features in all the gospels, in Revelation, and in Daniel. Jesus warned of him when he expounded on the prophecy of Daniel . Paul speaks as a matter of urgency, in 2 Thesalonians 2 v8-12, of the Man of lawlessness. And then the lawless one will be revealed, whom the Lord Jesus will overthrow with the breath of his mouth and destroy by the splendor of his coming. The coming of the lawless one will be in accordance with the work of Satan displayed in all kinds of counterfeit miracles, signs and wonders, and in every sort of evil that deceives those who are perishing. They perish because they refused to love the truth and so be saved. For this reason God sends them a powerful delusion so that they will believe the lie and so that all will be condemned who have not believed the truth but have delighted in wickedness. Dear children, this is the last hour; and as you have heard that the antichrist is coming, even now many antichrists have come. This is how we know it is the last hour. They went out from us, but they did not really belong to us. For if they had belonged to us, they would have remained with us; but their going showed that none of them belonged to us. But you have an anointing from the Holy One, and all of you know the truth. I do not write to you because you do not know the truth, but because you do know it and because no lie comes from the truth. Who is the liar? It is the man who denies that Jesus is the Christ. Such a man is the antichrist--he denies the Father and the Son. No one who denies the Son has the Father; whoever acknowledges the Son has the Father also. Note this is written to the people of God; not to the unsaved. John refers to an individual who is coming, whom he calls the antichrist as he denies Jesus is Christ, but he also says, “many antichrists have come.” The saints need to understand what has already happened and be ready for what is still to happen. There have been many antichrists through history. Antichrist means … Another Christ, in place of Christ – and to a lesser extent, against Christ. The picture is not like the movies; the bad guy being instantly identifiable and opposite in every respect to the good guy. The antichrist is likely to appeal to the church by looking and sounding like the real thing. John also speaks of the antichrists going out from us; so deception and delusion of the church is clearly part of the story. What is this delusion and deception, and how will the church fall for it? – Perhaps it will be another form of discipleship – more popular and less demanding. We should become like Christ, but are there other ways that can be seen in church? How have we learned of Jesus? If a prophet, or one who foretells by dreams, appears among you and announces to you a miraculous sign or wonder, and if the sign or wonder of which he has spoken takes place, and he says, "Let us follow other gods" (gods you have not known) "and let us worship them," you must not listen to the words of that prophet or dreamer. The LORD your God is testing you to find out whether you love him with all your heart and with all your soul. Note that “God is testing you” - here we see a true prophet, doing real signs, proclaiming a false god. These people arose, and will arise, under the sovereignty of God. Why does God do/allow this? He allows this in order to judge the world and purify the people of God with respect to our commitment to Jesus. These are Last Days matters; but the “last days” period, in scripture, started with God’s last word that was the death, resurrection and Pentecost of Jesus. Perhaps, when we talk of the last days, it would be truer to speak of the last hour. We are looking at the last test of that generation. The antichrist is the final test, “because they did not love the truth”. “God put it in their mind” - Consider all the world politicians and leaders and their humanistic arguments, consider the EU arguments “…..but remember - it is God. We need to avoid making simplistic deductions about the source of world trends. So, where is the Christian in this?
" This calls for patient endurance on the part of the saints who obey God's commandments and remain faithful to Jesus. Then I heard a voice from heaven say, "Write: Blessed are the dead who die in the Lord from now on." Who are the saints” John’s Revelation follows that given to Daniel. Daniel 11 v35 - … . Notice the reference to “Until the time of the end” – this is God’s last test – for the appointed time. Daniel 7 v25 - . What circumstances make the rise of antichrist possible? Man of sin / man of lawlessness. Antichrist - the man of lawlessness - (CJB calls him “the man who separates himself from Torah.”) The sense of this is not lawlessness in the sense of being an outlaw or bandit, so much as one who has rejected the constraints of God’s instructions. Aristochus Epiphanes (see Hannukah), was a type for Antichrist. Daniel 11 v31. Today is the time to study Daniel seriously! "He will be succeeded by a contemptible person who has not been given the honor of royalty. He will invade the kingdom when its people feel secure, and he will seize it through intrigue. Then an overwhelming army will be swept away before him; both it and a prince of the covenant will be destroyed. After coming to an agreement with him, he will act deceitfully, and with only a few people he will rise to power. When the richest provinces feel secure, he will invade them and will achieve what neither his fathers nor his forefathers did. He will distribute plunder, loot and wealth among his followers. He will plot the overthrow of fortresses--but only for a time. Daniel 11 v21-24 . Notice how he comes in “enter peaceably”(AV) / “through intrigue” / “ act deceitfully” and how he “ will achieve what neither his fathers nor his forefathers did.” This, with the end of chapter 9 and other words, has convinced many that he is the man who will be able to sort out peace, especially in the Middle East, where all before have failed. The return of the Jews to Jerusalem is an end times sign as Jesus said. Also many other developments could very soon fit in with the words given to Daniel. At that time Michael, the great prince who protects your people, will arise. There will be a time of distress such as has not happened from the beginning of nations until then. But at that time your people--everyone whose name is found written in the book--will be delivered. Multitudes who sleep in the dust of the earth will awake: some to everlasting life, others to shame and everlasting contempt. Those who are wise will shine like the brightness of the heavens, and those who lead many to righteousness, like the stars for ever and ever. But you, Daniel, close up and seal the words of the scroll until the time of the end. Many will go here and there to increase knowledge. " Daniel 12 beginning. So who is the final antichrist of history? What do we know? He dies and comes back to life - Revelation 14 and 17. One of the heads of the beast seemed to have had a fatal wound, but the fatal wound had been healed. The whole world was astonished and followed the beast. Men worshiped the dragon because he had given authority to the beast, and they also worshiped the beast and asked, "Who is like the beast? Who can make war against him?" Then I saw the beast and the kings of the earth and their armies gathered together to make war against the rider on the horse and his army. But the beast was captured, and with him the false prophet who had performed the miraculous signs on his behalf. With these signs he had deluded those who had received the mark of the beast and worshiped his image. The two of them were thrown alive into the fiery lake of burning sulfur. Then the dragon was enraged at the woman and went off to make war against the rest of her offspring--those who obey God's commandments and hold to the testimony of Jesus. The dragon transferred to the physical world and went to attack God’s faithful. Since Jesus spoke of when you see the abomination standing, he was talking of a man, not an ideology. Then the angel said to me: "Why are you astonished? I will explain to you the mystery of the woman and of the beast she rides, which has the seven heads and ten horns. The beast, which you saw, once was, now is not, and will come up out of the Abyss and go to his destruction. The inhabitants of the earth whose names have not been written in the book of life from the creation of the world will be astonished when they see the beast, because he once was, now is not, and yet will come. "The ten horns you saw are ten kings who have not yet received a kingdom, but who for one hour will receive authority as kings along with the beast. They have one purpose and will give their power and authority to the beast. They will make war against the Lamb, but the Lamb will overcome them because he is Lord of lords and King of kings--and with him will be his called, chosen and faithful followers." “What if I told you antichrist has already been? The seventh is the last; he comes for a short while and vanishes, and comes again. He is also the eighth, as he comes twice. He seeks the destruction of the Jews and the church. The Test - What is the identity of antichrist? Church, we had better wake up! We need to align ourselves God’s purposes, and that means with Israel! Israel will be delivered and the church will be purified. Are we ready? How is it that so much scripture is dedicated to this individual, and Jesus, John and Paul all warned of him, yet we who are living in these times pay so little attention? This is what Malcolm Hedding said about his Test Question. “Jesus will not share this revelation with us unless we come and sit at his feet”. Obviously, wildolive will not be handing you, on a web page, the answer. It is only for those who earnestly seek Jesus for understanding! I am still seeking. What do Daniel’s experiences have to say to us? Daniel 9 tells how Daniel came to receive wisdom and insight from God. If you have repented and been saved and grafted in, do you realise how greatly loved you are, and that you will be heard if you seek God like Daniel did? The Hebrew uses the word Chazaq (strengthen, be courageous, be firm, resolute) and asah (to do, fashion, accomplish, make) so this text translates literally that the people that know their God will “be strong and do”, but the context indicates being us strong in the LORD and achieving the great things He purposes in resisting antichrist. "Those who are wise will instruct many, though for a time they will fall by the sword or be burned or captured or plundered. When they fall, they will receive a little help, and many who are not sincere will join them. Some of the wise will stumble, so that they may be refined, purified and made spotless until the time of the end, for it will still come at the appointed time. We who have understood something of God’s purposes re Israel, where others have missed it, have work to do – it may be uncomfortable – we may stumble but we will be refined. We must seek the mind of the LORD and his purposes, rather than hoping to be smug about having secret knowledge. The time for revelation of these matters? "Go your way, Daniel, because the words are closed up and sealed until the time of the end. Many will be purified, made spotless and refined, but the wicked will continue to be wicked. None of the wicked will understand, but those who are wise will understand. Is now the “time of the end”, when these words are to be unsealed?